The Crow Remake Is a $40 Million R-Rated Revenge Movie? There are few movies that have been stuck in development in such a seemingly hopeless way as The Crow remake. For years, the project has been a revolving door of directors and actors trying to get this movie going. At one point, F. Javier Gutierrez (Rings) was attached to direct and, though he hasn't been involved in that capacity for a while, he is still set to be an Executive Producer on the movie. He has now revealed that, whenever the movie does actually get off the ground, it will be R-rated and it will have a budget of around $40 million. Which is pretty low for a superhero movie of this stature. F. Javier Gutierrez recently spoke with Forbes and he was asked about The Crow remake and the reported $40 million production budget. He admitted that he hasn't heard much about it recently, but he didn't dispute that dollar figure and he did confirm that the movie will be R-rated. When he was attached to direct, that was something he was very adamant about. Here is what he had to say about it. "With The Crow, I haven't talked to them in a while so I don't know what is going on with that, but we are going to do an R-rated movie. I come from Europe, I'm very dark so I'm going to go for it. If any movie has to be R-rated then it's The Crow. That's how I got James O'Barr, the creator of The Crow, involved in the project because he said that if R-rated is the way that I wanted to go, he's in. Even though I'm not directing it now, when I was going to be doing that I explained to the producers that they had to read and understand the comic book and not make the film a PG-13 version because it would make no sense. Some movies are for young people, I get it and maybe you can do it, but this movie is not necessarily for those young people and toning it down would give you a ghost of what The Crow should be." As it stands, Corin Hardy (The Hallow) is attached to direct, with Jason Momoa (Justice League, Game of Thrones) set to star as Eric Draven. The role was originally brought to the big screen by Brandon Lee, who was tragically killed during the filming of the 1994 version of The Crow. Last we heard, The Crow remake was supposed to shoot this January, but that didn't wind up happening. At the moment, Corin Hardy is busy shooting The Conjuring spin-off The Nun, while Jason Momoa has just started shooting Aquaman, which is sure to be an extensive shoot. That said, both of their schedules seem clear enough to possibly make The Crow their next project. But if history has taught us anything when talking about this remake, don't get your hopes up. The original movie version of The Crow remains a classic comic book movie, and a beloved one at that. With that said, it is the kind of movie that could truly benefit from a modern redo. Especially given the success of movies like Deadpool and Logan, which have made R-rated comic book movies something people really want to see. 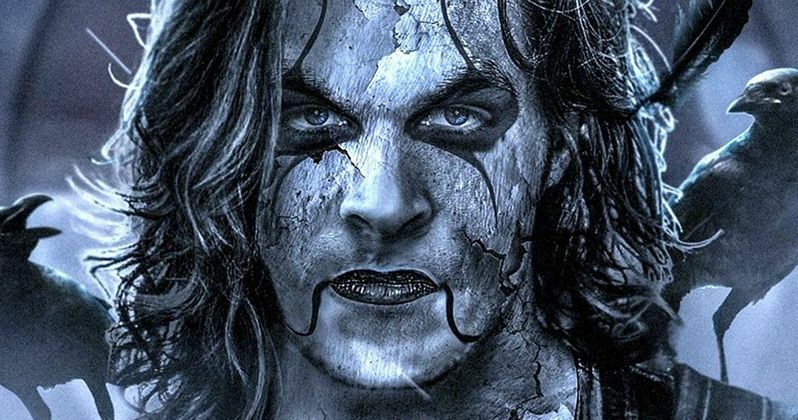 Last year, The Crow remake, currently titled The Crow Reborn, left its home at Relativity and went to Davis Films, Highland Film Group, and Electric Shadow, who will all co-finance and co-produce the movie. Maybe they will have better luck with it.